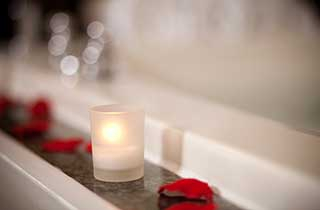 Arrive as early as 2pm and enter your suite embraced in the warm glow of candlelight with a bed adorned in a heart, made of silk rose petals. Then, dine at Social Gastropub, Stella's Restaurant & Bar, The Rose & Thistle Pub & Restuarant, or Tea Tree Asian Bistro, four of the area's hottest restaurants. At long last, begin the romance by slipping into your whirlpool tub with two in’spa’ration aromatherapy packets. Have a leisurely morning, knowing that checkout is at 1pm. Happy Anniversary!